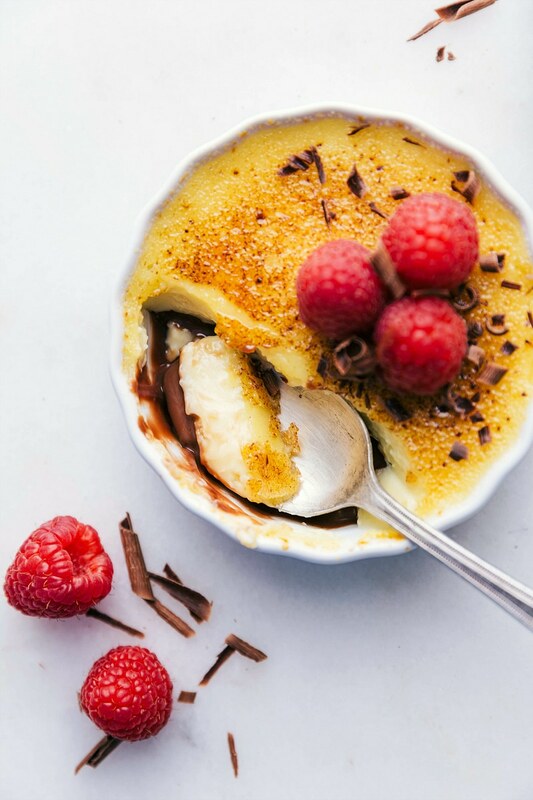 Tuxedo Crème Brûlée is a chocolatey twist on a traditional creme brulee recipe. This dessert has a chocolate ganache bottom, creamy custard filling, and a caramelized sugar topping. Top these brulees with fresh berries and chocolate curls for a delicious show-stopping dessert. 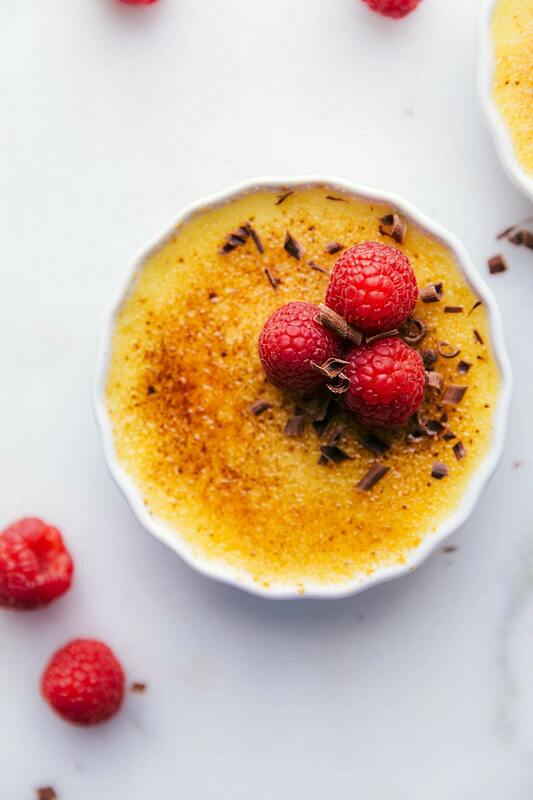 Once you’ve made (and fallen in love with) a traditional creme brulee recipe, you’ve got to try this fun variation! This post includes step-by-step photos and a video tutorial that will show you just how easy this fancy dessert is to make. One of my mother-in-law’s favorite treats is creme brulee (I’ll admit they’re one of my favorite desserts as well!) So when we got to have her stay with us after Elizabeth’s arrival, I knew I had to make a few brulees! She told me of a creme brulee she’d had at a restaurant with chocolate on top (no crispy topping). 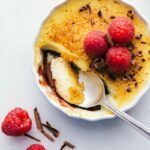 The chocolate lover in me was definitely intrigued… BUT my favorite part of creme brulees are the crunchy caramelized topping. So I decided to put the chocolate on the bottom and keep the rest the same. To say we’re hooked is an understatement! My current dilemma now: this version or plain for Valentine’s day dessert?! What is a tuxedo creme brûlée? How do you make homemade creme brulee? If you want to try a traditional creme brûlée check out this creme brûlée recipe. If you’re a huge chocolate fan, you may prefer this tuxedo version to the plain one – it’s just whatever you like best! How do you make tuxedo crème brûlée? Chocolate Ganache: prepare the base! It’s as easy as heating heavy cream and adding some chopped chocolate. Stir until smooth and fill the bottom of the ramekins with the chocolate. Custard Filling: the egg yolks, vanilla bean seeds, and sugar sugar get beat together until light and creamy. You’ll temper this mixture with hot heavy cream and then pour this mixture over the chilled chocolate ganache layer. 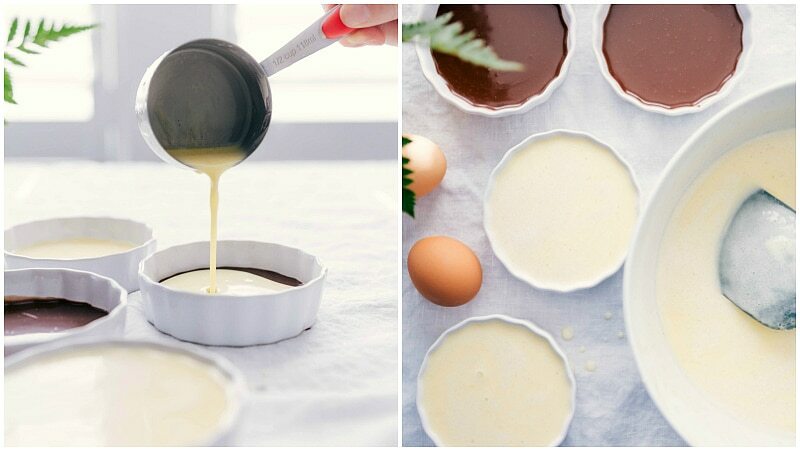 Bake the custard filling: place the ramekins in a 9 x 13 pan and fill the surrounding space with boiling water. It’s important to cook the brulees in this water bath! Bake for 30-35 minutes or until the center slightly jiggles. Caramelize the tops: add some sugar to the tops of your custards and torch the with a kitchen torch. Wait a minute and then these are ready to eat! Room temperature ingredients: make sure you set the eggs out to come to room temperature before using so they won’t “cook” when the hot heavy cream is added. 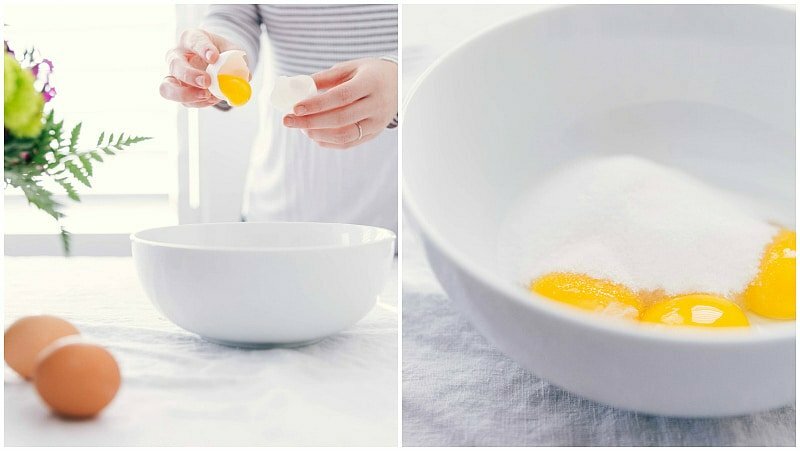 TIP: separate eggs and yolks while the eggs are cold (easier to separate) and let the yolks sit out until they’re at room temperature. Don’t over-beat your mixture: Once you start seeing bubbles in the mixture you know you’re done mixing. 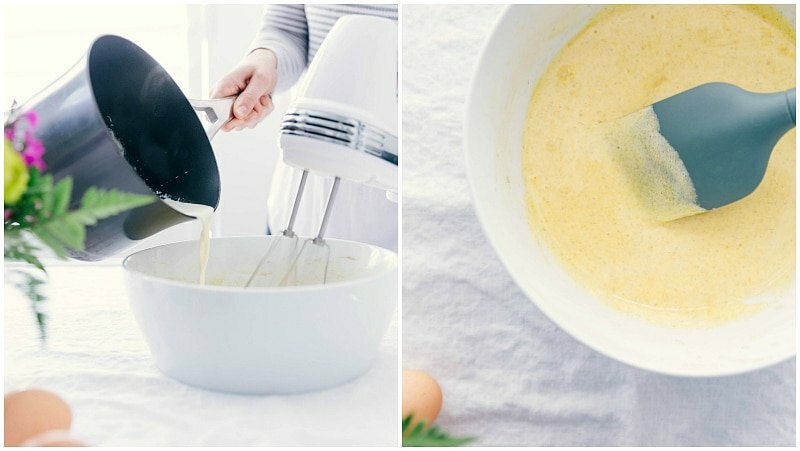 Over mixing adds too much air to the cream which will mess with the texture. Season: adding a touch of salt to the brulee and ganache mixture helps intensify the flavors. Cook the brulees in a water bath: placing the ramekins in a tray of hot water helps to cook the brulees evenly and slowly without burning. Use a kitchen torch: getting that perfect hard sugar top is much simpler than you’d think with a kitchen torch. Hold the torch about 6 centimeters away and don’t stay in any spot too long to avoid melting the custard beneath. Crystalizing happens for a second after you torched it which is important to keep in mind if you don’t want the sugar on top burned. If you prefer a little bitter sweetness you can burn the top of the sugar a bit more to get that bittersweet flavor. More common mistakes (and how to avoid them) here! Coarsely chop the chocolate. In a medium saucepan over medium heat, add the cream and bring to a just before a boil (don't boil). Reduce the heat to the lowest temperature. Add the chocolate and salt and whisk to combine until the chocolate has melted and the mixture becomes smooth and shiny. Remove from heat. 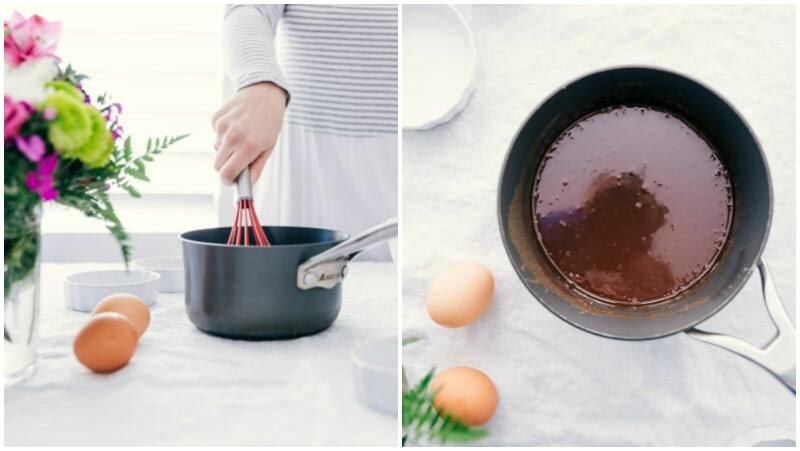 Divide the chocolate ganache evenly among all 6 ramekins so they are filled a little less than ¼th of the way full. Place the ramekins in the freezer and freeze for one hour. Start by splitting the vanilla bean down the center. Scrape out all the seeds and place into a large bowl. Take the vanilla bean pod and place in a small pot with the sea salt and heavy cream. Preheat the oven to 300 degrees F. Cook the heavy cream mixture just until the cream is simmering. Do not boil! Remove from the stovetop and set aside to slightly cool. Remove the vanilla bean pod (IF using vanilla extract, stir it in here). In the bowl with the vanilla bean seeds, add the egg yolks (I like to save the whites in a tupperware container for omelettes during the week!) and 1/2 cup sugar. Beat until the mixture is light, about 2-3 minutes. Meanwhile, place 6 cups of water in a large pot and heat to boiling point. Add about 1/4th of the cream mixture into the egg + sugar mixture. Mix until combined. Then pour the (now tempered) egg + sugar mixture into the remaining heavy cream mixture. Stir until combined. 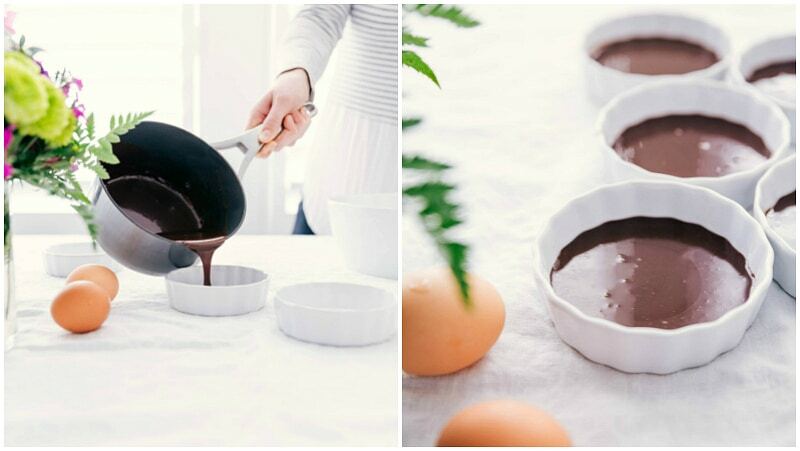 Remove the chocolate filled ramekins from the freezer and place in a metal 9 x 13 baking pan. Pour the prepared mixture evenly into the ramekins (you should use up all the mixture between the 6 dishes). Fill up the metal baking pan with boiling water halfway up the sides of the ramekins. Bake for 30-35 minutes or until centers are barely set (very slight jiggle). Cool completely at room temperature and then refrigerate for 3-4 hours before serving (Alternatively these can be refrigerated 4-5 days before using). When ready to serve, separate the remaining 1/4 cup superfine sugar on top of the custards. I find it helpful to use a little more sugar than needed to swirl the dish around and make sure the top is evenly coated with sugar (then just pour extra sugar onto the next ramekin). Use a kitchen torch to torch the tops until the sugar melts and browns (or even slightly blackens) a bit. Top with fresh berries and enjoy immediately ? Alternatively if you want to use your oven: move your oven rack to the top position and heat the oven to a high broil. Once the oven is heated, add the custards topped with superfine sugar to a tray. Place the tray on that top shelf and watch carefully as they broil. It only takes 1-3 minutes so watch closely to avoid burned crème brûlées. What a lovely twist ! I’ve done this prep for this Easter, test tasted it……. the creme is delicious but the chocolate is hard! Could it be 7oz of chocolate is too much or is 35% whipping cream too thick? Oh shoot! I think it might be slightly too much chocolate; an extra ounce could contribute to the harder layer. I wonder if it will soften a bit sitting out before torching the tops?